1. Cut the pork into thin strips. Add seasonings to pork, adding the cornstarch last. Marinate the pork for 10-15 mins. While pork is marinating, prepare vegetables, and sauce. 2. For Sauce: Mix the sauce ingredients, and set aside. 3. For vegetables: Cut bamboo shoots into thin strips. Slice the mushrooms and water chestnuts. Cut the green pepper in half, remove the seeds, and slice diagonally. For the bok choy, separate each stalk and leaves. Cut the stalk diagonally, and cut the leaves across. Cut the celery diagonally. Cut the onion in half, peel, and slice thinly. Place the vegetables on a lg. tray, being careful to keep each group separate (include the bok choy stalks and leaves), and set aside. 4. Heat wok and add oil. When oil is ready, add the pork. Stir-fry pork until redness is gone. Remove, and set aside. desired you can cook these with the pork), and the green pepper and snow peas together. When cooking the bok choy, add the stalk first. 6. 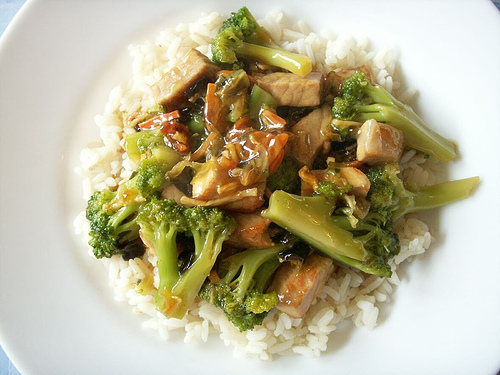 Add salt to taste, while stir-frying each group of vegetables. Add water, and cover wok while cooking bok choy, as it doesn't contain much moisture. 7. Reheat wok, and add oil. Give the sauce a quick re-stir. Add and combine all the cooked ingredients in the wok. Make a "well" in the center, and gradually add the sauce, stirring to thicken. 8. 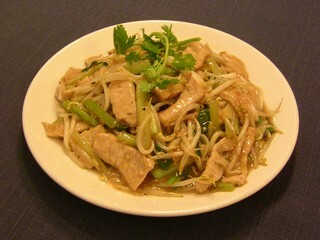 Once it has boiled, remove the chop suey from the stove. Serve hot.